Today, 7th October 2010, the Holy Synod gathered for the appointed Meeting of the Holy Synod of the Patriarchate of Alexandria, under the Presidency of His Beatitude Theodoros II, Pope and Patriarch of Alexandria and All Africa in the Conference Hall of the Hoy Synod. Before the Meeting, a Divine Liturgy was held in the Holy Patriarchal Chapel of Ss Theodoroi. At around 09h30 the Synodal deliberations began. The opening was declared by His Beatitude as he addressed the Members of the Synod. His Eminence Elder Metropolitan Paul of Memphis, first in the order of the Hierarchs of the Holy Synod, replied on behalf of the Metropolitans and Bishops to His Beatitude, to whom he addresses wholehearted congratulations on his multifaceted and tireless Hierarchal work. His Beatitude, as a gift of respect and honour to the elder hierarch, gave him a silver emblem of the ancient Patriarchate, on hi ninetieth year. His Beatitude then spoke at length to the Synod about the work undertaken during the past year in all fields of the ecclesiastical service of the Patriarchate (Conciliatory and Official visits to the Church of Albania, Greece, Cyprus, as well as Cappadocia, missionary and pastoral visits to the Holy Metropolises of Aksum, Khartoum, Johannesburg and Pilousion, ordinations of new hierarchs, receiving of heads of state at the patriarchal See, decoration of distinguished personalities, international conferences, administrative and service issues, renovation works with special mention of the creation of the Patriarchal Museum, the total renovation of the historical Holy Monastery of St George in Old Cairo, etc). Also, expressing the gratification of the C hurch of the Apostle Mark on the completion of thirteen productive years as a hierarch, His Beatitude gave an honourary distinction of the Cross of the Order of St Savvas with a Star to His Eminence Metropolitan Alexandros of Nigeria and to His Eminence Sergios on the occasion of his name day, he gave a valuable historical icon of St Sergios of Radonezh. He went on to announce the resignation given months previously of His Eminence Ignatios of Central Africa, the acceptance of His Grace Ignatios Bishop of Eleusina to the order of retired clergy of the Patriarchal Throne following his personal request for this, and the appointment of His Eminence Metropolitan Seraphim of Johannesburg and Pretoria as representing the Patriarchate of Alexandria on European Union Programmes. The creation by Patriarchal Decree of the Holy Diocese of 1. Botswana, 2. Sierra Leone and 3. Brazzaville and Gabon followed. Hierarchs of the Throne then read their reports of activities of the year 2009. 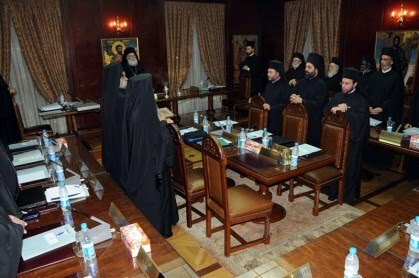 The deliberations of the Holy Synod of the Patriarchate of Alexandria will continue in the evening with the reading of more reports. The elected Bishop of Mozambique, Archimandrite Ioannis (Tsaftarides) was born in Angeryko Zakynthos in 1969. Following his schooling on the island of his birth, he studied at the Ecclesiastical School of Athens, the Theology Faculty of the University of Athens and the Theology Faculty of the University of Sophia from where he graduated in 2001. He received a Master’s Degree in 2010 from the Department of Greek and Latin Studies of the University of Johannesburg and is preparing for a doctorate at the same University. He was ordained Deacon on 21 November 1993 from the then Metropolitan Panteleimon of Zakynthos and on 17 December of the same year he was ordained Priest from the then Metropolitan of Dodonis (now Metropolitan of Zakynthos) Chrysostomos. He was consecrated as an Archimandrite in 1998 in Zambia by the late Pope and Patriarch Petros VII. Since 1993 he has served as a missionary for the ancient Patriarchate, serving in churches in Zimbabwe, Zambia, Cairo and South Africa. He has organized and participated in various conferences and has written various studies. On October 7th, 2010, by proposal of His Beatitude Theodoros II, Pope and Patriarch of Alexandria and All Africa he was elected by the Holy Synod of the Patriarchate of Alexandria as Bishop of Mozambique. The elected Metropolitan of Central Africa, Archimandrite Nikiphoros (Mikragiannanitis, known in the world as George Konstandinou) was born in Thessaloniki in 1949. Following his graduation from the Praktiko High School of Thessaloniki he studied at the Ecclesiastical School of Thessaloniki (1967-1969). In 1975 he graduated from the Theological Faculty of the Aristoteleian University of Thessaloniki and in 1999 was declaredas a Doctor of the Theological Faculty of the University. In 1971 he was tonsured a monk at the Holy Patriarchal and Stavropegiake Monastery of the Holy Trinity in Tsangarolo, Hania. On 22nd August of the same year he was ordained Deacon. In 1977 he entered the Agion Oros (Skete of St Anna) and appointed as a teacher at the Ecclesiastical Academy of Mount Athos. He then went on to become deputy Head and in 1988 following a proposal of the Holy Community of Mount Athos, he was appointed by the Ecumenical Patriarchate as Dean. In 1978 he was ordained to the Priesthood by His Grace Chrysostomos of Rodostolos and was later consecrated as an Archimandrite by His Eminence Nikodimos of Ierissos and Mount Athos. In 1997 he resigned from the Athonite Academy and following an invitation from His Beatitude Archbishop Anastasios of Albania, he took over the organization of the first Ecclesiastical High School in Argyrokastro. Since 2006 he has participated in the administration of the Orthodox University of the Congo “St Athanasios the Athonite”, where he lectures. He has written many studies and has participated in many conferences in Greece and overseas. On 7th October 2010, proposed by His Beatitude Theodoros II, Pope and Patriarch of Alexandria and All Africa, he was elected by the Holy Synod as Metropolitan of Central Africa.